Mauro Giuliani was a composer deeply rooted in the everyday musical life of the Vienna of his era, a city on which Mozart had recently left his mark, where Haydn's art had come to his final flowering and where Beethoven and Schubert were soon to tower above all others. Never in the history of the guitar has the instrument been so close to and so in tune with the great names of classical music. 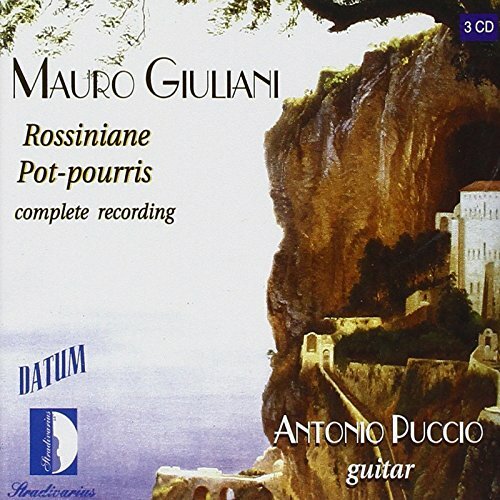 On this release, Antonio Puccio presents Giulianis complete Rossiniane and Pot-Pourris. Giuliani arranged many nineteenth century opera themes for the guitar. His work Le Rossiniane includes numerous themes from the operas of Rossini, including Otello, LItalienne a Alger, Cendrillon, and others. He wrote his Pot Pourri in 1811, more than a decade before his Rossiniane. These two sets of pieces have been rarely performed and recorded, and quite unfairly so. Originally recorded and released to great acclaim in 1999, this album is now available nearly twenty years later, and still just as significant.